The last ebook you checked out of the library might have been purchased just for you. Giving patrons the power to choose the books the library buys is one of the ways libraries in Nova Scotia and beyond are saving money and moving into the future. It’s called “patron-driven acquisition” and it’s starting to turn the old system on its head. Traditionally, the job of choosing which books to purchase has fallen to librarians, who use their training and knowledge of the library’s clientele to fill the shelves with an appropriate selection. “In our case, about 60 per cent of the printed books that we purchased from 2005 to 2010 had never circulated. And that’s not unusual,” says says Ian Colford, a collections librarian at Dalhousie University. But the ebook market created an alternative to the old system – sometimes called the “just-in-case” model – to a new patron-driven system some refer to as the “just-in-time” model. 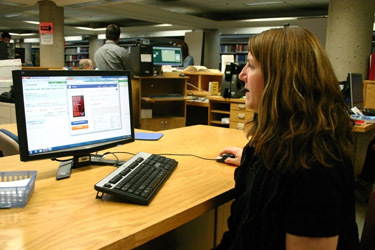 Under this system, a library doesn’t actually own many of the books listed in its electronic database. A book is only purchased when a patron finally checks it out and downloads it. “Rather than our selecting a title … and keeping our toes and fingers crossed that that’s what they need, we can offer 10 similar titles and then let the user, through searching our online catalogue, identify what best meets the needs they have,” explains Saint Mary’s University librarian Marie DeYoung. In an age of shrinking budgets for libraries, it’s a way to ensure every dollar counts. Other tricks stretch that money even further. Usually, a book isn’t purchased the first time a user reads it. Instead it’s recorded as a “short-term loan” and the library is charged around 10 per cent of the list price. After about five such loans, the library can be reasonably sure the book is worth keeping and purchases it permanently. The recent Novanet Ebook Pilot is entirely built around a patron-driven model. The 10 participating university libraries deposited $100,000 with an ebook vendor for shared access to 16,000 titles. In the two months the pilot has been running, less than $10,000 of that deposit has been spent, says Novanet manager Bill Slauenwhite. For now, patron-driven purchases make up only a small percentage of acquisitions for Halifax libraries, but the number is growing. “I don’t think the dust has settled yet,” says DeYoung on whether ebooks and “just-in-time” purchases will one day account for the majority of SMU’s collection. Some librarians are resistant to the idea, says Slauenwhite. Acquisition duties have always been a major part of their job — and one they’re reluctant to give up. A future without librarian-selected books is unlikely, in any case, DeYoung says. In the meantime, says DeYoung, the changing world of libraries is an exciting place to be.